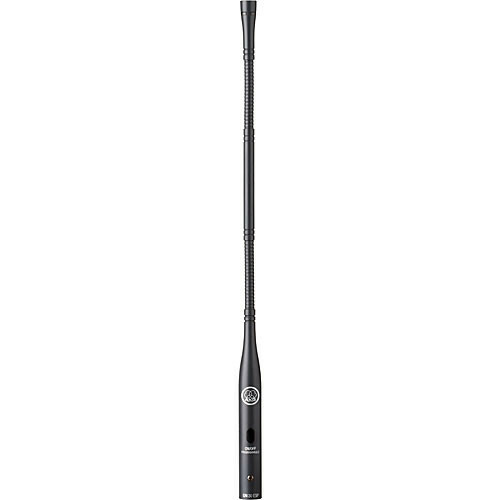 The AKGN30ESP from AKG is a 12" gooseneck with an XLR male terminated output connector. The gooseneck accommodates the AKG CK series microphone capsules and its adjustable gooseneck is designed to provide noise-free operation. The gooseneck mount also features integrated bass roll-off filter switch and a programmable On/Off, Push-to-Talk and Push-to-Mute switch with power indicator LED. The XLR Male output is conveniently adapts to surface mounts with XLR female inputs and provides quick installation and removal. Low frequency roll-off filter switch reduces low frequency noise caused by ambiance, and structure noise.